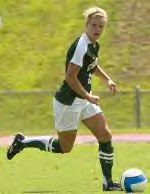 Four members of the Charlotte 49ers nationally-ranked women’s soccer team earned preseason All-Atlantic 10 honors. Senior midfielder Hailey Beam, junior forward Whitney Weinraub and junior defender Whitney Bryant named to the preseason All-Atlantic 10 team. Freshman defender/forward Taylor Rovito was named to the preseason A-10 All-Rookie team. The preseason All-Atlantic 10 teams were selected by a vote of the league’s 14 head coaches. Last season, Beam, Bryant and Weinraub played integral roles in helping the 49ers win their third straight A-10 regular-season title and their second straight A-10 tournament championship. Charlotte reached the second round of the NCAA Tournament with a school-record 18 wins.